As part of the fast-casual cafe chain’s reinvention process, Panera Bread will soon be replacing cashiers with kiosks for customer orders. Panera is set to add the kiosks to all its locations nationwide. The plan is to have the kiosks at 400 locations, or roughly 50% of the chain by the end of 2015. The trend-setting dining chain is combining several technologies — from store kiosks to online and mobile ordering. This movement will slice the number of cash registers at most stores when the changeover is complete in late 2016. The fast-casual chain could be cooking up a major change in the way consumers order fast food . For decades, the $200 billion fast-food industry has relied on a system that often results in long lines at cash registers and at drive-thru windows. Others fast-food giants — from Domino’s to Pizza Hut to Chipotle — are experimenting, too. But Panera appears to be one of the most ambitious combinations of technologies geared at speeding-up service. The new technology results in labor savings for Panera, allowing for more employees within the cafe itself. But what does this mean for the customer? “The kiosk and other digital interfaces encourages true menu browsing — not only of ingredients, but also nutritionals — which has led to an increase in personalized orders,” Blaine Hurst, Panera ‎Chief Transformation & Growth Officer, told Business Insider. It also results in shorter lines and improved accuracy for orders. Most stores will get four to eight kiosks. At the same time, an unspecified number of cash registers will be removed. Customers also will be able to order from their mobile phones or laptops while in Panera. And they’ll be able to place “to go” orders via mobile or online up to five days in advance — and pick up the orders at a pre-set time. Panera is onto something pretty clever with the system. One restaurant industry consultant says that faster service — particularly via mobile ordering — is the single most talked-about issue at industry conferences. “The cell phone is now your wallet,” says Dennis Lombardi, executive VP at WD Partners. If a cell phone is a wallet, it must be charged! Companies such as Veloxity rent and sell cell phone charging kiosks to restaurants chains like Panera. Charging systems will fit in nicely next to the register kiosks because of the technology advancements. When you update one part of your company you need yo update all of it to make it run smoothly. 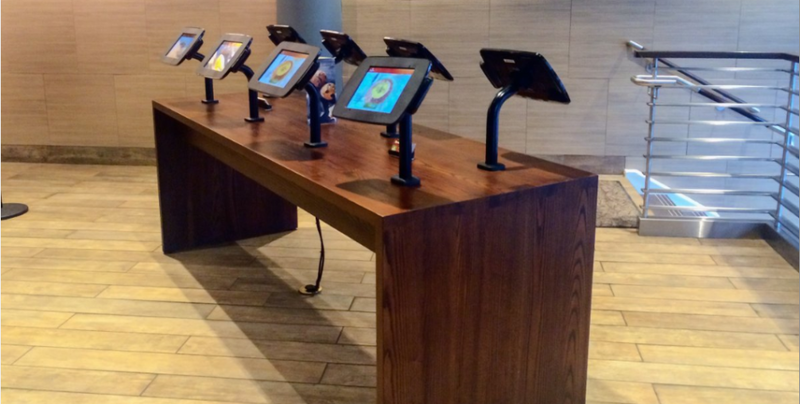 Adding charging stations are the next step for Panera. Experiments with such in-store automation largely failed a generation ago… But a whole lot has changed in twenty-five years.